Since Adobe Reader does not provide any editing capabilities, I had to find a (free) tool to edit my PDF metadata. As you know, setting the correct metadata is essential for storing the correct information and finding the document through SharePoint Search. 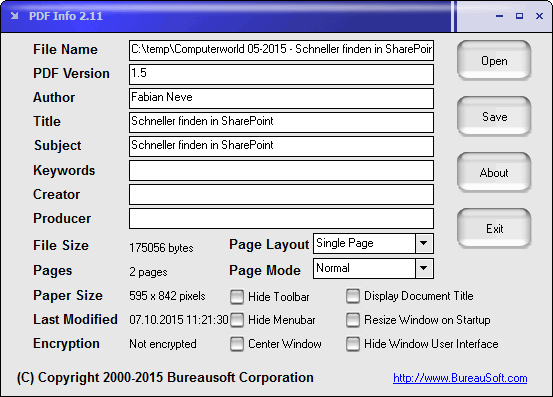 What I've found so far: PDF Info from Bureausoft. Unfortunately you have to install it (not portable) at the GUI is soooo 90s! Ok, late ninties... almost 2000. Very ugly. But useful. You can edit the metadata and save the PDF without recompressing or anything like that. Only edit the metadata. Download PDF Info here (Freeware).